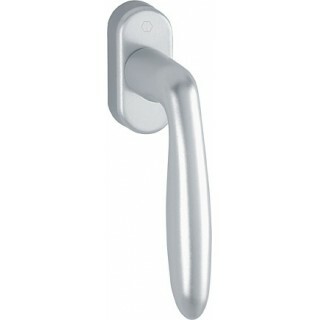 Tilt and turn window handle Hoppe aluminium Verona series on oval rose. Window Handle Verona series made by a famous German firm Hoppe. Made of alluminium with reinforced mechanism for longer life. The rosette measuring 66 mm in lenght, the handgrip 124 mm. All Hoppe handles possess a functional warranty up to 10 years.